The Guide hit stores last week, and we are listing the corrections we find and hear about here. Return for regular updates, unless we got everything else right. I was reading the EVERYBODY HURTS injury report and I love the lyrics theme that you got going on. As a DJ I understand the long hours that goes into the craft so I can appreciate the incorporation of lyrical references in a fantasy football write up. On page 24, the section about A.J. Green you mentioned “Buy, Buy, Buy” and referenced the Backstreet Boys. This was actually N’sync. I am not sure that is the actual joke because they are both forgettable or it was an error. On page 2, in the credits for the Position Pages, Marc Meltzer’s name is spelled incorrectly. Sorry Marc. Washington Post Poll Supports Dan Snyder’s View! PETA suggested way to retain team name without slur. 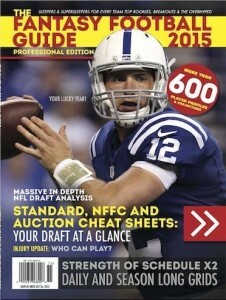 A couple of years ago I made the decision to drop the Washington NFL team’s name from The Fantasy Football Guide. “Ms. Houska, who lives in Washington, said she was bracing for all the people who would be waving the poll in her face — “the poll, the poll, the poll” — and saying she had no right to be offended by the name of the local football team. That the matter is even up for debate baffles her. After the first magazine issue without the team name came out I received a number of angry letters from people saying that if they’d read the Editor’s Letter about the issue before buying the magazine they would have put it back on the rack. Some were mad because I was attacking their team, their Nation, and they would not stand for that. Others were mad because they saw in my stance the influence of the mad culture of political correctness, in which it is suddenly and (to apparently many) improper to seek to avoid needlessly insulting people and hatefully reminding them that they have it worse than you. I’m sure we lost some sales since then to these folks, but sales overall are up andI get more letters each year from folks who like the magazine than the year before, so I can live with the consequences of pushing this small principle. But learning today about this poll disturbs me a bit. Could it be true that 90 percent of the polled Native Americans don’t have a problem with the Washington team’s name? And the poll reports that 80 percent would not be offended if called redskin by a non Native American. There are questions about the poll. The sample was small and there are questions about the demographics. I would be more suspicious of these results if they didn’t echo a 2004 Annenberg poll on the issue that has always been looked at as on the margins, since so much Native American institutional strength was allied against the Washington NFL team name. The Times article goes into the process of once offensive expressions becoming something else, relates stories from different cultures, but returns ultimately to Ms. Houska, and ends with her quote, which I included above. It’s well worth reading. Now, production is underway on the Fantasy Football Guide 2016 and I’ve got some thinking to do. Ten percent of 5.4M Native Americans is 540,000 people. That’s not a small number to offend with something as trivial as a team name. I’m inclined to continue the boycott, even if it isn’t politically correct in these times. In the Fantasy Football Guide 2015 Professional Edition mock draft, we had a glitch (as discussed earlier on the corrections page). Tim Heaney, sportswriter at USA Today, friend, and all around good guy, was unable to connect with the draft room, and his team was autopicked. The problem was that we did not have time to gather another 14 fantasy experts and have another mock draft, and while Tim’s team was not one he would have picked in a million years, it wasn’t a total joke. Tim agreed to comment on his autopicks, and we decided to run with what we had. Kind of like having an online draft with 13 regs and that one guy who always screws up. We sometimes make misteaks. Sometimes big misteaks. This is the place we list them and try to make it right. We very much appreciate your helping with this. Send any errors to askrotoman (at) gmail.com. Thanks. I am disappointed with your magazine. You have several players as this years breakouts and as overhyped players. Can you explain why they are in both categories? Your mock draft is a joke. I enjoy reading different writers strategies on why they picked who they did and what adjustments they had to make during the draft. All you did was a auto draft. 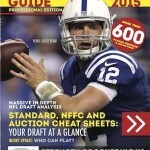 I would not recommend your 2015 Fantasy Football Guide to anyone. 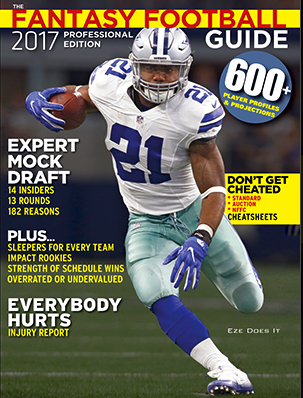 The front section of the magazine are one line comments by the magazine’s writers about NFL awards and the top Rookies, Breakout and Overhyped players for 2015. It is a jumble of different opinions by different writers, who are identified by name. Some writers think some players are potential Breakouts, while other writers think those same players are being Overhyped. This is a feature, not a bug. It is the conversation about these competing points of view that should help us sort out who to take earlier this year, and who to take later. As for the Mock Draft, we had a mix up and 13 owners drafted their teams live, and Tim Heaney did not. Because of the timing it was not possible to redo the Mock, and Heaney kindly enough wrote about the draft software’s picks. I wish it were different, I would like to know Heaney’s actual choices for those spots (hmm, I think I should have asked him), but those of us involved with the draft thought the information was still valid and useful, even if not pure. I’ll post other issues here as they come in. The following are my fault. I seem to have joined the 2015 team name to these guys, rather than their new teams. I’m sorry for the error. Thanks to Corey Stanley. Page 53, Larry Fitzgerald Profile: Should have a Cardinals helmet. Page 40, LeSean McCoy is on the Bills, not the Eagles. Page 40, DeMarco Murray is on the Eagles, not the Cowboys. Page 51, Andre Johnson should be on the Colts. The Spring Training Football Yes FOOTBALL Podcast Is Posted! 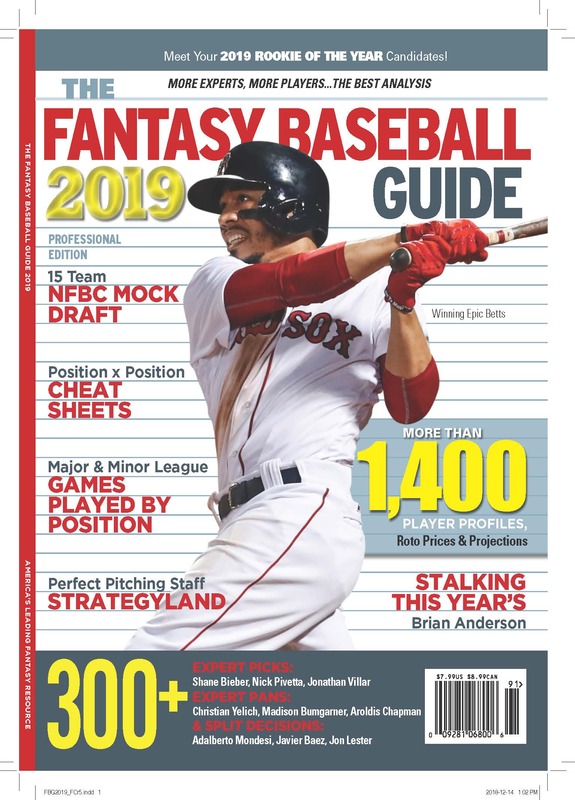 It kind of ticks me off when I’m searching for fantasy baseball news during spring training and I come across people talking about football. I mean, everything in its place! But Andy and Derek, who handle the fantasy football podcast here DURING football season, got excited and started talking. Please forgive. Please listen, if you care to, and then get back to baseball! The Week 15 Fantasy Football Podcast is Posted! Andy and Derek preview this week’s big games, from a fantasy playoff perspective. Come On Up to the Table! The Week 13 Fantasy Football Podcast is Up! Andy and Derek’s podcast this week is full of tips to help you win your game this week, without having to loosen your belt. Good luck. Fantasy Football Podcast Week 12! Andy and Derek discuss this week’s games.